I uploaded a doc, I put the toc inside it and show me this. 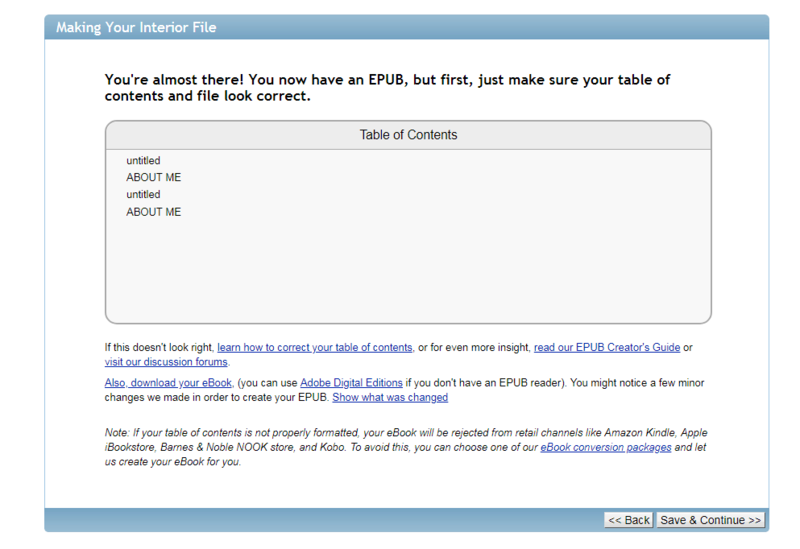 This is not my table of contents. If I continue to the cover, I will have a problem with the toc? It means your title is not assigned heading style 1 and you have a blank space that has been given a heading style. Go back to word doc and fix or download Sigil and generate toc based on headings. It looks like the H1 is getting assigned to a blank line and "ABOUT ME" rather than the necessary title and section elements. I would wipe all the formatting back to default/Normal style, then reapply Heading 1 to the title and Heading 2 to any content you want readers to be able to navigate to (chapters, index, etc). If that doesn't solve it, I think you might want to have our support staff look at the file to see if they can determine why the styles aren't applying correctly. The doc file if someone helps me, thanks a lot! I opened it up and I see nothing wrong with it. No spaces or nothing with wrong headings. Maggie might see something I missed. In looking at your screen-shot I had an idea I tested. I uploaded an example file twice. It would appear you fixed your file, but need to delete the older unfixed versions from your project. Oh, I didn't even think of that, Papi. Good catch. I thought of it since there are people who prefer to upload a chapter at a time, meaning the converter won't auto-delete or overwrite old files. PS. 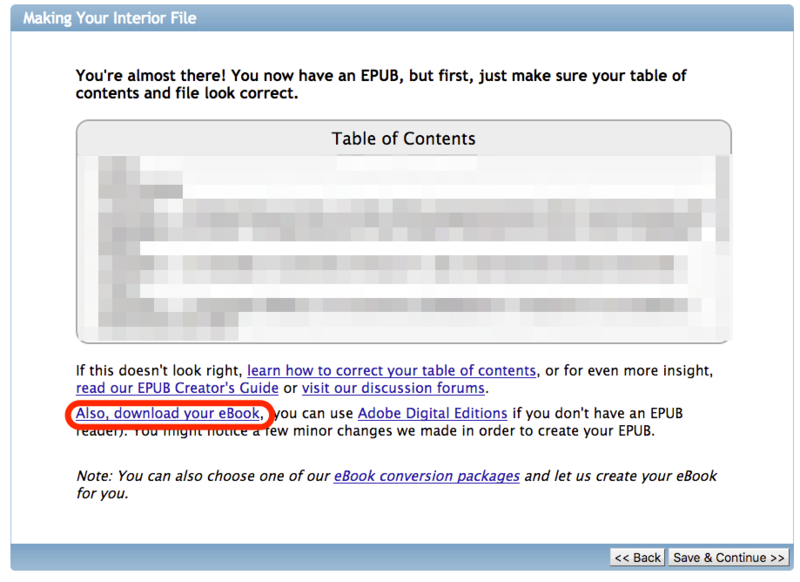 Preview your book using Adobe Digital Editions to see what buyers will see. Make sure your italics are still there after conversion and your images are where they have to be. If they are not, there're only a few things you have to do to make them perfect. You're almost there. 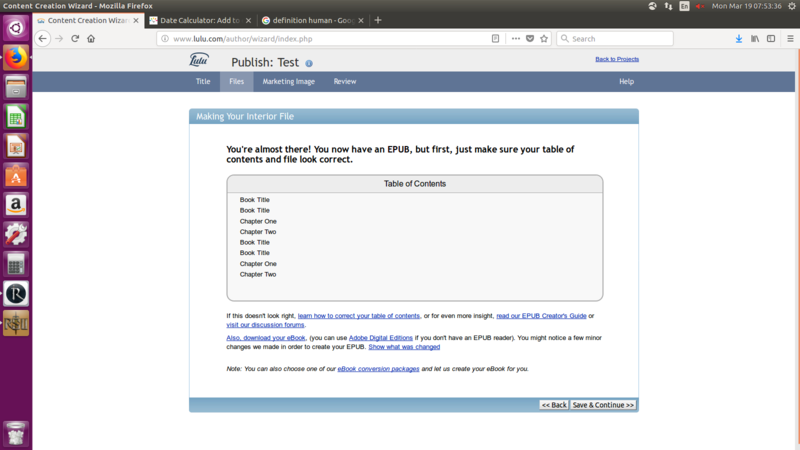 Calibre [available for Windows or Linux] is another decent way to check the results of epub or mobi conversion. Maggie I checked out the site you referred me too about selling shirts. I think you have to design and upload vectors to do it. 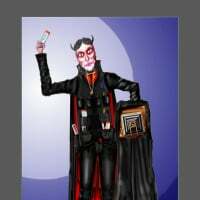 I do have a friend though that does this for a living and will see if I can talk her into making me a logo. Just images. Vectors not necessary. I did one to test it. I can do it for you in Photoshop. Just tell me what you want on it or draw something rough by hand and take a picture of it. Simply old training coming into play in a far different venue. After more than two-odd decades I still haven't figured out the cause of mist that travels uphill against the wind, so even with training there are limits. Papi thank you so much!! Thank you guys!! Maggie I ll check it, I uploaded it without seeing what happens inside!! 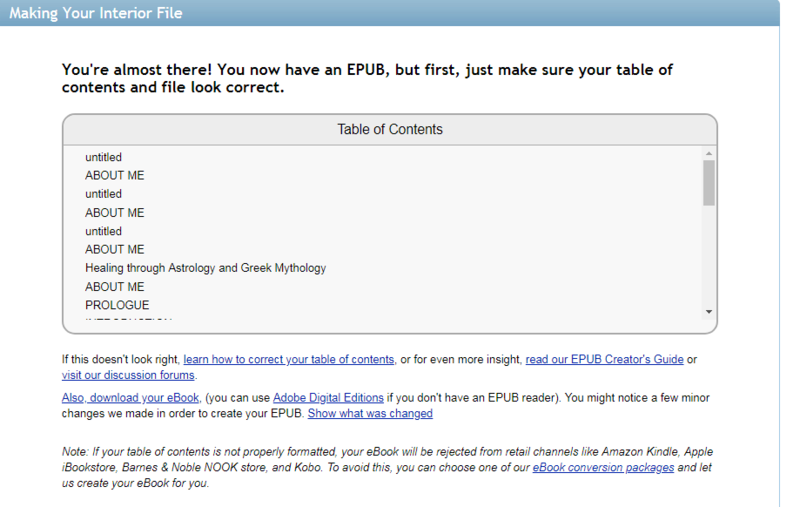 Where should I go to see it as an epub? I don't know if the file I clicked on here is an old one or a new one. But it is a doc with many many carriage returns used to create spaces and to move on to a new page, and many many tiny and large empty frames. Possibly empty image frames? There's also Footers with page numbers in them. There's also a pre-created hyperlinking TOC. Thanks Maggie, but I have no idea what to use. If you want to try something and send it I'd be more than grateful. After you convert the file it gives you a link so you can download it and look it over. The link isn't terribly obvious on the post conversion screen, so I added a screen grab to help you find it. 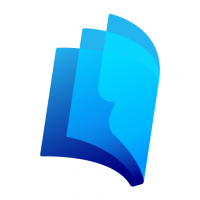 There is also a link to Adobe Digital Editions on that page, which is a great way to view your epub and check it over before continuing. 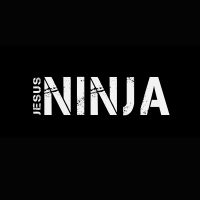 TJN, I'm going to use JesusNinja so as it make it more universal. I can see a storm happening. Give me a few days. 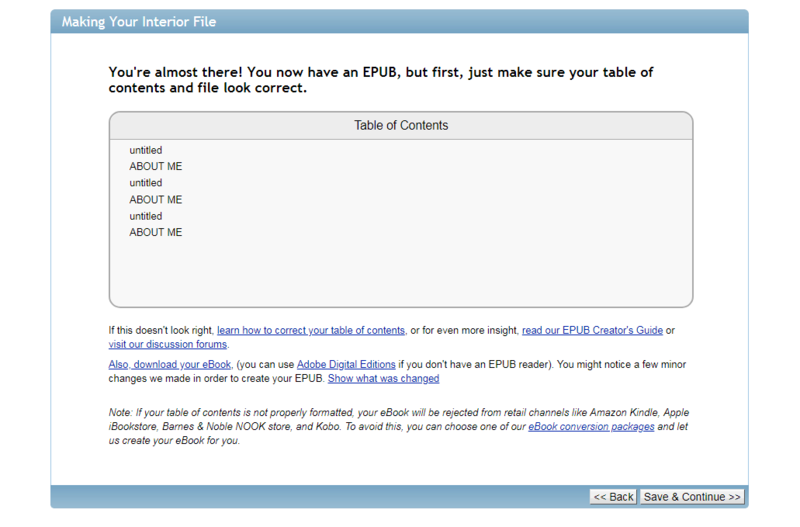 So all the things I mentioned are OK for a doc for an ePub then?